As we reported earlier, Samsung is working on a bunch of Galaxy A series smartphones that could be released in the coming months. This includes the Galaxy A9, the Galaxy A3X, the Galaxy A5X, and the Galaxy A7X. 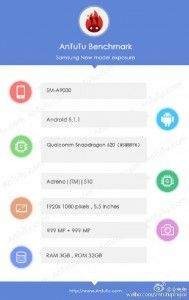 Now, specifications of the upcoming Galaxy A9 have surfaced on the Internet. 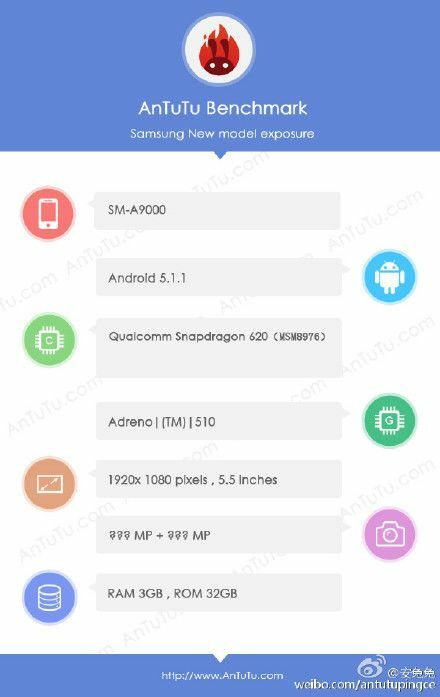 According to the AnTuTu benchmarks that we’ve stumbled upon, the Android 5.1.1 Lollipop running Galaxy A9 (SM-A9000) will feature a 5.5-inch Full HD Super AMOLED display, a Snapdragon 620 processor (MSM8976) with Adreno 510 GPU, 3GB RAM, and 32GB internal storage. There are no details regarding the camera on the upcoming device; but we should see at least a 16-megapixel primary camera considering the A9 will be a sequel to the Galaxy A8. Samsung recently imported components of the Galaxy A9 to India for testing but not the actual device, which makes us think that it might still be at least three or four months away from being officially announced. In any case, we will report more details about the device as and when we get them.